Though the new TFS 2015 build process is out, you may still find yourself needing (or wanting?) for whichever reason to use the XAML build definitions for Team Foundation Server. "But how can we take advantage of modern front-end build tools to provide better organisation and ensure code quality while still using the XAML definitions?" you might ask. Hopefully this gist will get you there. As an exploratory process, a small task force of us at TDOT have configured a build definition such that a gulp process transpiles either TypeScript or ES6 (why not both?) into a separate output folder, runs Jasmine unit tests on the output script, and fails the build when the Jasmine tests fail. This is assuming that your gulpfile is in the root of your project and that the gulp task you want to run is "build". If any of these are different, change the script accordingly. In case you, like me, hadn't heard, the current best practice in the Node.js community is to check in your Node modules into your source control (*gasps! *) - or at a minimum just the executables you need, but with anything other than front-end assets, that's really tough to do. This will save you from those subtle-version-changes-which-make-you-feel-like-you-took-crazy-pills bugs from running npm install in a different environment at a later time. Select all items in the window that pops up, click Next >, and make sure all items are in the Items to add tab. If some are in the Excluded items tab, select them all and click Include item(s), then click Finish. This takes all of our source scripts, concatenates them together, minifies the concatenated script, and outputs it into a `Scripts/dist/` directory. Fancier tasks and configuration could have simply an unminified `app.js` bundle for development purposes with source maps, and an unmapped minified `app.min.js` file for deployment. This task bundles everything into an app.js file and places it into an output directory of scripts/dist/ with accompanying sourcemaps. You can configure gulp tasks to hook into a number of different Visual Studio controls, but for our purposes here, this gulp task will only run on a solution build or when manually invoked. 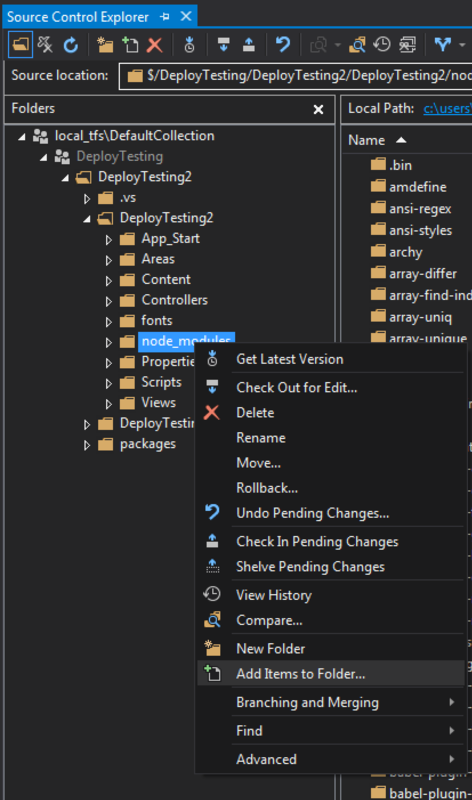 By default, when Visual Studio recognizes the presence of TypeScript files, it will automatically transpile them into ES5 into the same directory where they exist when a save or build occurs. Since we're letting gulp handle the transpiling of TypeScript, this is at least unnecessary, if not downright annoying, and wastes processing time and power on every save or build on creating extra file output. This should effectively burn any TypeScript compile functionality on behalf of Visual Studio to the ground, if that's what you want. Now that you have a front-end build process up and running, you probably want to integrate tests to run on your output scripts (you do want that, right?). We'll first configure Chutzpah and Jasmine locally, then integrate them into the remote build in the next section. Via NuGet Package Manager, install both the packages for Chutzpah and Jasmine. If you have a separate test project, you only need to install them to that project. Next, under Tools > Extensions And Updates, install the Chutzpah Test Adapter for the Test Explorer. This allows you to see and run your Jasmine tests in Visual Studio's Test Explorer window. TFS builds output files into a build staging area. The files output into the staging area then get copied to the final location (the 'drop' location). If a build were cued with the project as is, the gulp build task would run, since we configured it in a <PreBuildEvent></PreBuildEvent> tag. The output files would only be placed alongside the rest of the source code for your solution and would not even make it to the staging area, however, since TFS hasn't been instructed to look for them or copy them. This takes the output files from the src/ directory of the build and places them in the staging area (the bin/ directory). When the staging area files get copied to the drop folder location, the output scripts will make it to the final directory. That's great - now when you run the deployed app, code that was developed in ES6 or TypeScript is getting transpiled and running from the remote build. But we want to also test that code when it builds, so we need Chutzpah to hook into the build process. The first step is to make sure the chutzpah.json file makes it into the remote build. Right click it, select Properties, and make sure the Copy to Output Directory option is set to Copy always. In the window that pops up, click Add.... Check the box Fail build on test failure, and for Test assembly file specification:, type **\*.js. Hit Okay twice and then save your changes. If you'd like a different/more specific path specification for your test directory, you can try that, but another blog warned that this was generic **\*.js glob was the only way that worked for them. I had no success with using <reference/> tags, while others have only had success with <reference/> tags but not by defining references in the JSON itself. Hopefully at this point, your builds are failing if the Jasmine tests are failing. Comments & questions can be submitted to my gist writeup of this process.